An advertisement for the Jung Brewery that was printed in the 2nd ed. of The Settlement Cook Book. Image courtesy of the Milwaukee Public Library. Mass immigration from eastern and southern Europe dramatically altered America’s ethnic and religious composition around the turn of the twentieth century. Unlike earlier immigrants, who had largely come from western European countries like Britain, Germany, Ireland, and Scandinavia, the new immigrants came increasingly from Eastern European countries such as Hungary, Italy, Poland, and Russia. This influx of immigrants provided the labor power that fueled the nation’s industrial growth between 1880 and 1920. Despite their contributions, religious and cultural differences existed and caused issues. These troubles, combined with a western European association of these new immigrants with labor strife and urban poverty, brought anxiety and opposition from native-born Americans, who, ironically, were themselves descendants of previous migrations. The large influx of immigrants from Eastern Europe to America’s cities concerned middle-class America. Some sought to limit immigration from these countries deemed “less desirable,” while others looked for ways to help this new class of Americans assimilate to their new surroundings. Lizzie Black Kander. Image courtesy of the Wisconsin Historical Society, ID: 38113. German-Jews had been part of an earlier migration to America. They were affluent, liberal, urban, and democratic—not different from the general character of Wisconsin itself, which allowed them to share in Milwaukee’s prosperity in the 1850s. The new wave of immigration during the 1880s and 1890s brought more Jewish immigrants to Milwaukee, altering not only the composition of the city, but of Jewish identity itself. These were not sojourners or “birds of passage” with dreams of one day returning to their native countries after sharing in America’s prosperity. Chased out of Czarist Russia and Austria-Hungry and persecuted for their religious beliefs, these immigrants had no intentions of returning. By 1895, the Jewish population had grown from 2,074 to about 7,000 with Russian Jews comprising about 39 percent of the Jewish community. Milwaukee’s older, established German Jewish community saw the Russian Jews as strikingly different from themselves. These new immigrants were unaccustomed to city life, Orthodox in their religion, and very poor. Lizzie Black Kander worked to eliminate the chasm between the established German-Jewish residents and the eastern European newcomers. She spanned this gap through teaching cooking courses at the Settlement house within the Jewish kosher tradition spawning the idea to create The Settlement Cook Book while acculturating them to the America. Cooking class at the second Settlement House at 499 5th St. in 1907. The building has since been demolished. Photo courtesy of the Jewish Museum Milwaukee. The social settlement movement was formed out of the desire to aid new immigrants and the urban poor. Settlement houses provided services ranging from basic, material needs, to child-care services, even classes on how to become an American citizen. Most settlement houses started as clubs and classes and then campaigned for large-scale issues like housing and labor reform. As they aided people, settlement houses also tried to instill middle-class values and often had a paternalistic attitude toward those they served. Settlement houses came because of the Social Gospel Movement, an attempt to apply religious ethics to social issues, particularly those affecting the urban poor. Although primarily identified with Protestantism, Lizzie Black Kander’s efforts to assist immigrant newcomers in Milwaukee’s Haymarket District came out of American Reform Judaism. 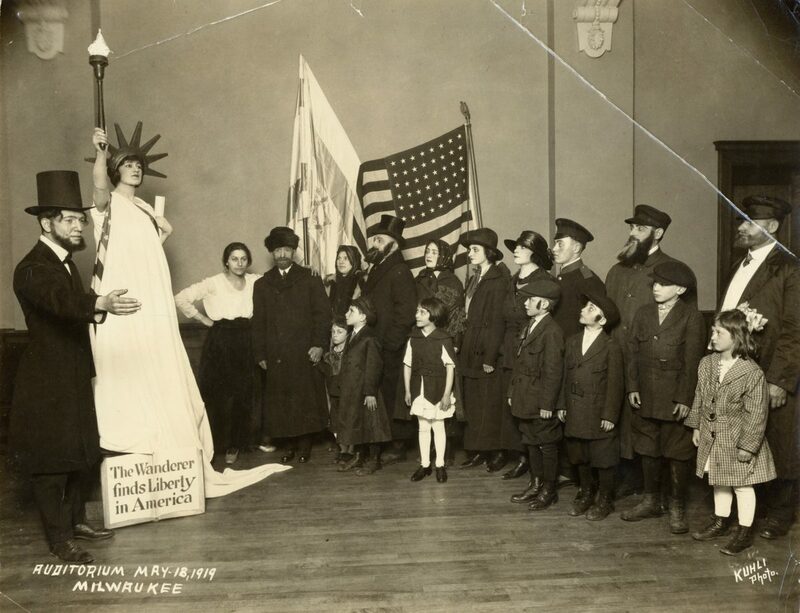 Featured image: Scene from Poale Zion Chasidim, an Americanization pageant held in the Milwaukee auditorium to welcome Milwaukee’s new citizens, 1919. Image courtesy of the Wisconsin Historical Society, ID: 5348.